Now get ready for some tennis action in Rio Olympics as the action-packed tennis tournament is scheduled to be played from 6th to 14th August. The tournament will comprise of 172 players featuring in five major events including singles, doubles and mixed doubles. For the qualifications of this competition, top rated 56 players in singles competition would be eligible to play as per the rankings displayed on 6th June 2016. The entry would be limited to 4 players from each country. In doubles competitions, 24 teams will be qualifying for the tournament based on the rankings displayed in 6th June 2016 with maximum of two teams per NOC. Players standing in top 10 ranking would be eligible to reserve a place if they provide a partner of their choice to compete alongside. So not making you wait anymore, here's the Rio Olympics 2016 Schedule which will be played right after the Wimbledon 2016. The Rio Olympics tennis tournament will comprise of a single elimination, in which player will only clear the round after winning match. There will be six rounds in single competition while five rounds in doubles competition. Players who will be reaching the semi-final will have the opportunity to compete for the medal. Losing semifinalists will be contesting again for a bronze medal match. Matches will be played in the best of three sets for both women’s single and doubles while in case of men’s single, it will be best of five sets. Tie breaker will be operated for each of the set in order to decide about the person winning the set. This tie breaker excludes the deciding set. In case of mixed doubles, third set can be played as a tie-breaker up to 10 points. Players will be competing in Men’s, Women’s Single and Mixed doubles for Gold, Silver and Bronze medals. It will be an interesting and competitive action format in which viewers will have the luxury to watch their top players fighting for the medal and competing on hard surface. 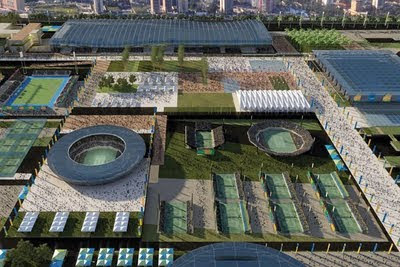 2016 Rio Olympics will be the 15th edition of Olympics featuring tennis tournament. One exception in this event is that the games played in Olympics will not provide any ranking point for players unlike previous editions. It will be played on hard court surface so one can expect fast tennis action. A total of about 32000 tennis balls will be available and used in this game.